It is called the “ultimate sanction that would really hurt”. It worked in South Africa. It can work in Israel too. Swift sanctions against Israeli banks will isolate Israel from the world system of trading. Israeli banks will be unable to pay for imports or receive payment for exports. Fellow Capetonian activist Terry Crawford-Browne used to be an international banker. Yet when South Africa was on the brink of a civil war in the 1980s, he became an activist. At the time he used his expertise to implement Swift sanctions against South Africa. The importance of this intervention cannot be underestimated. The SWIFT sanctions were a game-changer. They were powerful, effective, immediate and they gave impetus to the non-violent resistance in South Africa. Now Terry advocates for a smiliar step against Israel. The Belgium-based Society for Worldwide Interbank Financial Telecommunication system, known as Swift, is a secure messaging system used by more than 10,500 banks for international money transfers. Swift sanctions are also considered against Russia – as a “the ultimate sanction that would really hurt”. Read the article here. 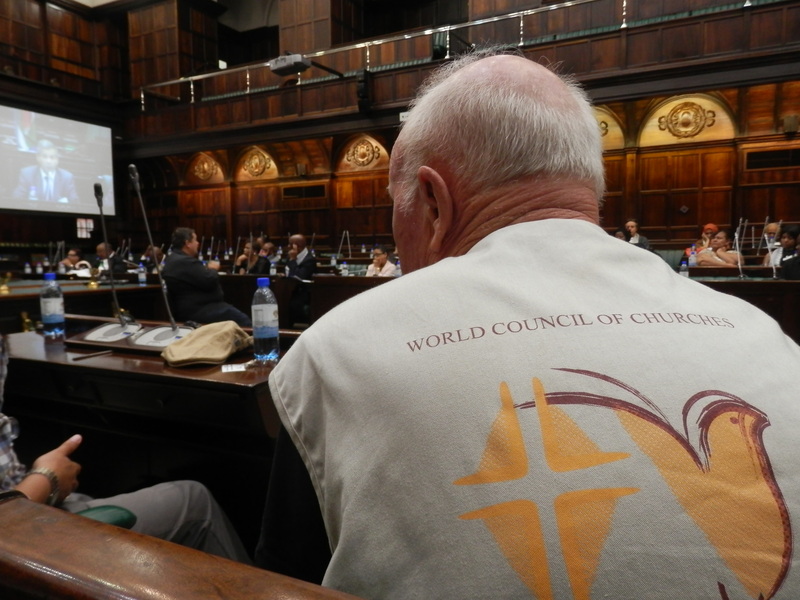 Four South African ecumenical accompaniers who served in the World Council of Churches’ Ecumenical Accompaniment Programme in Palestine and Israel (EAPPI). From left to right: Marthie Momberg, Terry Crawford-Browne, Corbin August and Carol Martin. 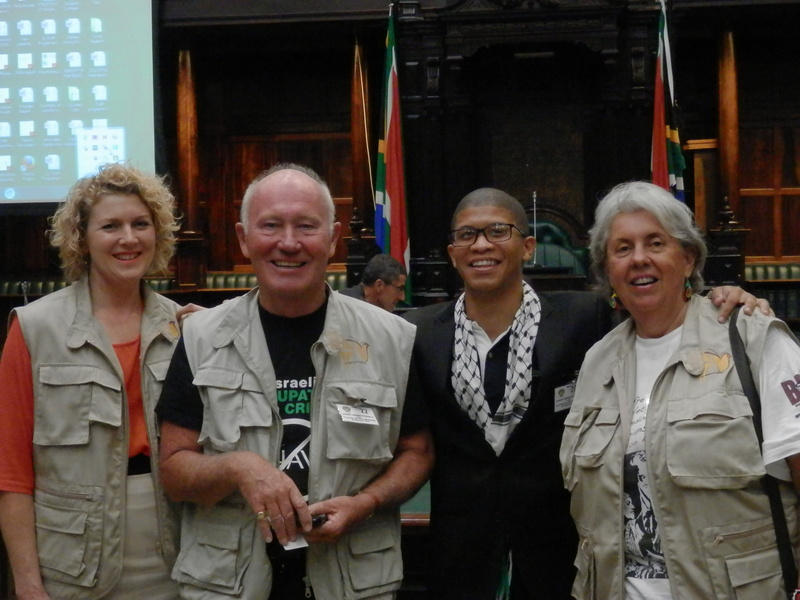 The photo was taken in the South African Parliament on 6 February 2014. The international banking sanctions campaign launched in October 1985 by Bishop Desmond Tutu, Dr Allan Boesak and Dr Beyers Naude became the tipping point in South Africa’s relatively peaceful transformation from apartheid to constitutional democracy. It was a nonviolent strategy intended to avert a looming civil war. International trade and sports boycotts and numerous resolutions at the United Nations had created conscientiousness about apartheid, but in themselves could not defeat the system. The critical factor was the role of the US dollar as settlement currency in foreign exchange markets. Without access to the New York bank payment system, apartheid South Africa would be unable to pay for imports or receive payment for exports even from third countries such as Germany or Japan. Under the “adopt-a-bank” strategy, the church leaders applied their influence with American churches to pressure the major New York banks to choose the banking business of apartheid South Africa or the pension fund business of the respective Anglican, Catholic, Presbyterian and other denominations. The City of New York later added the choice between the City’s payroll accounts or the banking business of apartheid South Africa. Even the Bush (senior) administration in October 1989 surprisingly issued an ultimatum to demand compliance by the apartheid government by February 1990 of the first three of five conditions, namely: (a) the end of the state of emergency, (b) release of political prisoners and (c) unbanning of political organisations. That was the background to President FW de Klerk’s announcement on 2 February 1990. Mr de Klerk has subsequently conceded that the threat contained in that ultimatum to close off all South African access to the American financial system motivated his decision to release Nelson Mandela and to begin constitutional negotiations. The fourth and fifth objectives of the banking sanctions campaign were: (d) repeal of apartheid legislation and (e) constitutional negotiations towards a democratic, non-racial and united South Africa. Three decades later, banking technology has advanced dramatically. The pressure point in the international payments system is no longer in New York, but is now at the Society for Worldwide Interbank Financial Telecommunications (SWIFT) which is headquartered in Belgium. In essence, SWIFT is a giant computer cooperatively owned by 10 500 international banks in 215 countries that daily authenticates interbank payment instructions for more than 20 million international financial transactions. SWIFT’s function has been to replace the cumbersome and labour-intensive authentication system traditionally known as “testing,” which verifies the payment instructions of correspondent banks. SWIFT is overseen by the central banks of the G10 countries, with the National Bank of Belgium being the lead overseeing authority. Every participating bank has a SWIFT code, the fifth and sixth letters of which identifies the country of domicile. As examples, South African banks are identified by the letters ZA; Israeli banks by the letters IL. The impact of SWIFT is such that a bank that is not part of the SWIFT network is essentially excluded from the international financial payments system. Banking is the lifeblood of any economy. Just as all South African banks were complicit in funding and upholding the apartheid system, so too the role of Israeli banks is fundamental to the Israeli government’s illegal occupation of Palestine. Money laundering and financial crimes are now regarded as serious international threats, and thanks to forensic auditing can increasingly be traced and identified. In fact, given the advances in technology, Israel is much more vulnerable to a banking sanctions campaign than was apartheid South Africa during the 1980s. Israeli banks fund the construction both the “apartheid wall” and the settlements, which the International Court of Justice in 2004 found to be illegal in terms of international law. The banks provide heavily subsidised mortgages to induce over 700 000 Israelis to live in illegal settlements such as Ma’ale Adumin, Har Homa and Zufrim as well as providing regular banking services in those communities. Israeli banks are also a critical factor in repatriating the financial proceeds to Israel of blood diamonds, drug trafficking and Israeli arms exports, all of which are crucial to the Israeli economy. Just as South African banks during the apartheid era were actively engaged in “sanctions-busting,” so too Israeli banks all blatantly participate in illegal transactions under the guise of “national security.” It is impossible to separate legitimate transactions of Israeli banks from illegal transactions that violate international laws on money laundering and war profiteering. Accordingly, all transactions to and from Israeli banks must be deemed to contravene banking protocols such as international obligations imposed on financial institutions to “know your customer”(KYC) and other due diligence procedures to mitigate financial crimes. Major international banks such as JP Morgan Chase, BNP Paribas, HSBC, Barclays Bank, Credit Suisse have recently been heavily fined for failures to meet such obligations. Seventeen European governments, including the Belgian government, in June 2014 warned their citizens of the reputational and other risks involved in financial transactions to and from the settlements in the Occupied Palestinian Territories. All countries, even including the United States, regard the Israeli settlements as illegal. Norwegian, Danish and Dutch pension funds and banks are already blacklisting Israeli banks. SWIFT declares itself to be “neutral” in respect of sanctions. Since sanctions often only apply in certain but not all jurisdictions, SWIFT cannot voluntarily suspend transactions unless regulations are enacted by laws of its home jurisdiction, namely Belgium and the European Union (EU). To date, the EU government statements about financial transactions with the settlements are warnings rather than regulations, but the “writing is increasingly on the wall.” The image of the banking industry is currently poor, and SWIFT and its 10 500 members would certainly not wish to be publicly identified as complicit with Israeli war crimes. Given these developments. SWIFT earlier this year has expanded its operations to include compliance management registry, including sanctions screening and testing. To this purpose, SWIFT will conduct a two day conference in Boston, USA during 30 September to 1 October to establish standards to assist banks in addressing financial crime compliance regulations. This registry is expected to go live at the end of 2014. The Russell Tribunal on Palestine (RToP) — which met in Barcelona, London, Cape Town, New York and Brussels between 2010 and 2013 – has already collated a huge volume of evidence on Israeli government violations of international law, including that its behaviour towards Palestinians meets the legal criteria of apartheid as a crime against humanity. The recent Israeli bombardment of Gaza prompted the United Nations Human Rights Council on 23 July 2014 to establish a commission of inquiry on Israeli war crimes. Similarly, the RToP has now decided to establish an extra, extraordinary session to be held in Brussels during 24 and 25 September 2014 to investigate the implications of the latest Israeli war crimes in Gaza. Just as the campaign against apartheid was driven by international civil society, so too it is now imperative for civil society to apply pressure upon EU governments to meet their obligations in respect of war crimes and crimes against humanity. Given the outrage over the disproportionate and illegal Israeli government actions in Gaza, there is increasing recognition of the need for a permanent resolution of the Israeli-Palestinian conflict. Indisputably, just as the international community judged apartheid in South Africa to be a threat to world peace, so too is the Israeli-Palestinian conflict. The Israeli government is a repeated violator of international law including the Geneva Conventions. SWIFT sanctions against Israeli banks offer a nonviolent instrument in the cause of peace in the Middle East to balance the scales between Israelis and Palestinians so that, unlike the failed US “peace process” and the Egyptian-brokered ceasefires, meaningful negotiations become possible. Being directed at Israeli banks, SWIFT sanctions are targeted at the financial and political elites who have the influence and clout to alert and warn the Israeli government of the consequences of financial isolation from the international community. The intention is not to destroy the Israeli economy but, instead, to bring the highly militarised Israeli government to its senses. Once the Israeli government agrees to these conditions, SWIFT sanctions can immediately be reversed in order to minimize economic damage to the Israeli economy.